Rough idling is easy to determine as your car starts to deliver poor performance and sometimes the engine stops running when you are idling. You can often also feel the strange vibrations inside your car while sitting in the driver seat. However, modern cars do often have great engine mounts, and you do sometimes have to open the hood to check if the engine is vibrating or even jumping on idle. There are various reasons why your vehicle starts to rough idle and it can result in horrible performance, loss in power, poor fuel economy and other major engine related issues as well. It is recommended to fix the rough idling issue as soon as possible or else the repair can get too expensive. When you start the engine and let it run without pressing the pedal, it is called idling. When the engine is left in idling position, it maintains a steady but low rate of revolution approximately 1,000 RPM. The RPM needle stays constant, and this indicates that the vehicle’s engine is receiving the correct amount of air and fuel. On the other hand, if the engine is not receiving the right mixture of fuel and air, it will start to rough idle. If your car starts to rough idle, it is probably having difficulty in maintaining a steady rate of rotation. Rough idle could be caused due to many problems including a damaged fuel injector, worn out the air filter, bad spark plug etc. We will discuss some of these causes to help you determine easily why your car is rough idling. Misfires are probably one of the most common reasons when it comes to rough idle. Misfires are often caused by a bad spark or a faulty air-fuel mixture. When your engine is misfiring, it will often also light up the check engine light and store trouble codes. Check the trouble codes with an OBD2 Scanner to easier find out which cylinder the misfire appear on. If your engine control unit is clean from misfires, you should first remove and visually inspect the spark plugs to see the damage. If you know a lot of carbon deposit on the plug it means that there is a rich mixture of air and fuel. Whereas, oil deposit indicates bad piston rings or leaky valves. 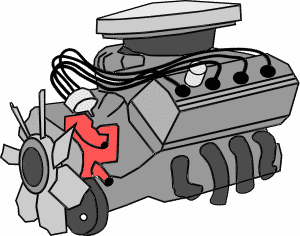 The spark plugs, wires, and the ignition coils are all inter-connected with each other. The spark plug delivers electric current from the ignition system to the combustion chamber and creates a spark to ignite the fuel/air mixture. 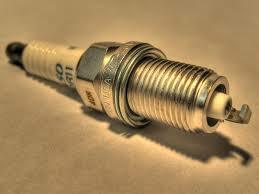 Over time, the spark plugs get damaged due to the carbon deposit or other waste product from the combustion process. This reduces the amount of power generated after the spark plug ignites. This condition results in rough idling along with other engine related problems as well. This is often called misfires. If you notice ash deposits, it means that you are using a poor quality fuel or there is some oil leakage. It is also recommended to check the spark plug wires as well as the ignition coils and replacing the necessary component. An Idle control valve is often fitted on older cars. This is a valve that is restricting the air entering the manifold and therefore adjusting the idle RPM. If the Idle Control valve is faulty, you may experience rough idle. On more modern cars, you have a throttle body that is adjusting the idle instead of the Idle control valve. It’s a common problem that the Throttle body valve gets dirty and it will cause a rough idle. You can try to remove it and clean it if it’s dirty, but sometimes you have to replace the whole throttle body. On a bit older cars, there is also a throttle body sensor that could get faulty and needs to be replaced. The modern fuel injectors are highly efficient and are capable of spraying precisely the right amount of fuel into each cylinder at the right time. These fuel injectors have a small opening from where the fuel is sprayed, and this opening sometimes gets clogged during the combustion process. The can cause the fuel injector to spray less fuel on one or several injectors, which leads to a drop in the performance causing the engine to be rough idle. In such a case, it is suggested that you take your car to a mechanic who will clean the fuel injectors using solvents or other additives. 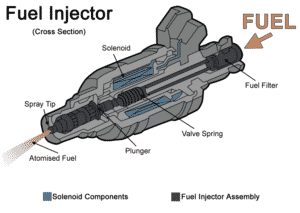 If the fuel injectors are extremely old, it is recommended that you get them replaced. Fuel filters can easily get clogged as they filter the contaminants in the fuel before it reaches the engine. A clogged fuel filter stops the engine from receiving the right amount of fuel causing the engine to be rough idle. Fuel filters are often pretty cheap, and you can easily get the fuel filter removed and replaced from a nearby mechanic or do it yourself if you have some knowledge. The air filter does an outstanding job to protect the engine from dirt, dust and other contaminants. It can get clogged or dirty after some time if not changed or replaced. The engine does not only need fuel to function correctly but requires an adequate amount of air as well. A clogged air filter will not allow clean air to pass through causing a rough idle. To remedy the situation, have your air filter replaced with a new one and also have the housing serviced to clean any dirt buildup. The oxygen sensor is located in an extreme high-temperature area and its primary function is to monitor the oxygen content of the exhaust. This information is sent to the ECU which then determines the correct air-fuel balance for the effective combustion process. If the oxygen sensor gets damaged due to carbon buildup, it sends incorrect information to the ECU which results in an improper mixture of air and fuel. A faulty oxygen sensor triggers the check engine light and a trouble code in the engine computer. You can have the oxygen sensor replaced to fix the problem. The coolant temperature sensor is sensing the temperature of the coolant and adjusting the fuel mixture after the temperature. If the sensor is sending faulty values, it can cause a lean or rich mixture and create a rough idle. Intake leaks are often causing rough idle also. Check for any broken vacuum hoses or a bad intake manifold gasket. Modern vehicles come equipped with an efficient fuel injection system along with an advanced ignition system. However, older cars used carburetors and mechanical ignition systems. If you own an old car and are experiencing rough idling, it is a good idea to clean the carburetor and check the hoses for damage or dirt buildup. Rough idling is a serious issue and should not be ignored for a long time. If the problem persists and is not fixed, it can lead to engine failure as well. Thus, we recommend that you take your car to a professional mechanic for a checkup as soon as you notice some symptoms. Rough idle is often caused by Misfires or a lean or rich mixture. The best way to find the reasons for a rough idle is to use an OBD2 Scanner; it can save you a lot of time and money. You can often find these pretty cheap on Amazon, and it is for sure a significant investment. You can find out our Top List of the best OBD2 scanners to buy here. If you have any other questions about rough idle, you are welcome to comment down below, and we will answer your questions as fast as possible.